Erwin van Dijk has successfully navigated two seasons in English football and remains with the club who gave him his first managerial post: Eastbourne Borough. 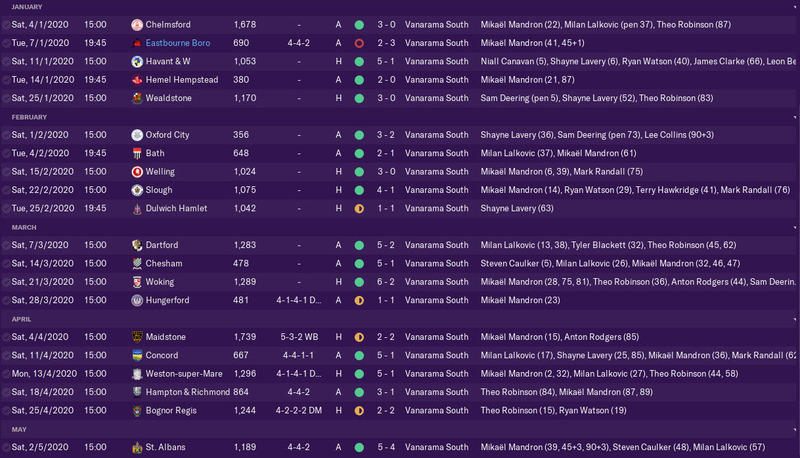 In this post, we’ll review the entire second season with Eastbourne to see if van Dijk has built upon the encouraging signs we saw in the previous post. Being at a part-time club means that at the end of each season there is a high chance of a large number of players leaving. Players cannot be offered a contract that extends past the next season and as such the majority of players contracts expire yearly. Erwin van Dijk is using this to his advantage as he is constantly able to improve upon his players. High earners who have not impressed don’t just hang around earning money waiting for their contract to expire in 3 years – they leave at the end of the season. This has allowed van Dijk to manage his wage budget effectively to bring in some quality players. Having sorted out the staffing situation at Eastbourne, van Dijk’s new scouting team set about finding players that could push the club to the next level. To do so, van Dijk sent his scouts to the Premier League / Championship under 18 teams based in southern England. Through scouting the teams, van Dijk was able to find young players whose contracts were due to expire. Here is an example from West Ham’s under 18’s squad. 4 players are due to expire at the end of the season and can therefore be approached to sign on a free. This method allowed van Dijk to improve his squad wholeheartedly. Thomas Hughes was signed from Ipswich, Lorent Tolaj from Southampton and Michael Mullings from Watford. Two further players to mention are winger Charlie Lawrence and full-back Bailey Owen, both players left the club before the end of the season but were very influential in their time at the club. Eastbourne began the season in sensational form, remaining unbeaten for the first fourteen matches. This included an impressive run of six clean sheets in a row in August/September. Remarkably, Eastbourne were not the only side to be unbeaten as Billericay sat atop the league with an impressive goalscoring record. They would certainly be the team to beat this season. One of the key factors behind our impressive form has been Erwin van Dijk’s tactical tinkering. For the majority of the first season Eastbourne developed a 4-4-2 system that focused on strengths out wide. Playing with a deeper midfielder seemed to give our wide players more freedom to attack. Defensively we looked more solid and this showed with the clean-sheet run we had at the beginning of the season. The good league form transferred to the cup matches as Eastbourne progressed through to the FA Cup 1st round and the FA Trophy 1st round. Late season form – Title Challenge? 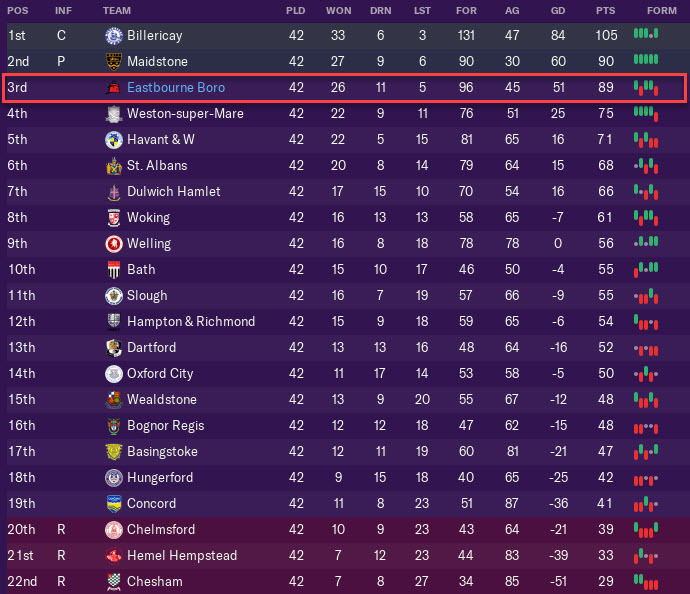 Unbelievably, Eastbourne Borough found themselves in a title challenge moving into the second half of the season. This is a concept that even Erwin van Dijk’s imaginative mind would have struggled to invent at the same stage last season. However, as the season progressed it became clear that Eastbourne would be fighting for second place. Billericay were simply dominant in the second half of the season, losing just once – and that was against us! Billericay’s end of season form – unstoppable! Eastbourne, on the other hand, stumbled slightly in their race for second place and Maidstone were right behind us waiting for the slip-up. 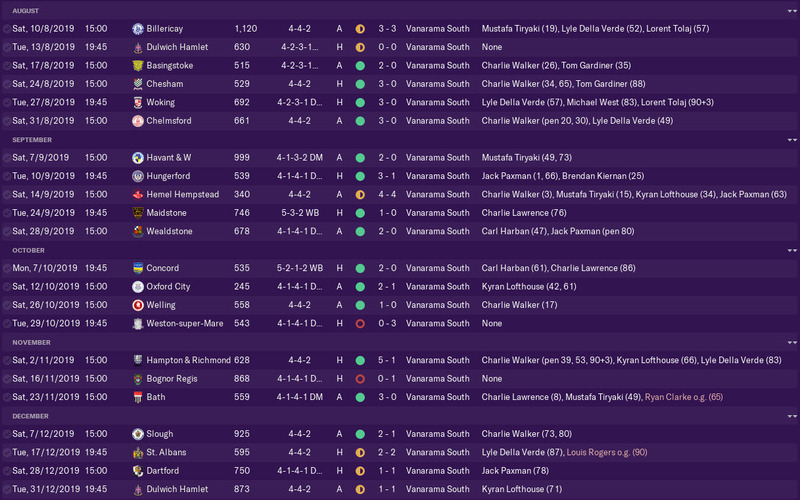 It came down to the final game – Maidstone won (as did Eastbourne) which meant that Eastbourne finished the season in 3rd place and would enter the Vanarama National South Playoffs. To say the season has been a huge overachievement is fair, the media predicted us to finish in 10th and after last season we would have taken that! Eastbourne were drawn to play St Albans in the semi-final of the playoffs. St Albans were the team to beat Eastbourne in the penultimate match of the season and as a result Erwin van Dijk could send his team out looking for revenge. Revenge was indeed found as Eastbourne ran out comfortable 4-2 winners, despite going down 2-0 in the first twenty-five minutes. This win saw Eastbourne meet Maidstone in the final. Maidstone, like Billericay, had an excellent second half of the season which saw them both catch and overtake Eastbourne to finish in 2nd. Ever-present Mark Smith started in goal. Smith has played every single league match under van Dijk and has rewarded his faith with countless crucial saves in matches this season. A back four consisted of Ben Herd, Mark Haines, Tom Gardiner and Curtis McDonald. Gardiner, like Smith, has been a key member of van Dijk’s side over the past two seasons and is growing into a leader in this Eastbourne squad. Michael Mullings, showed earlier as one of the signings made by van Dijk, injured his calf against St Albans which saw him miss the playoff final. In midfield, Brendan Kiernan started as our right-winger with Lyle Della Verde out on the left-wing. Carl Harban played as our deep-lying playmaker with Jack Paxman alongside him as the mezzala. Starting up front we had Charlie Walker, top scorer for Eastbourne over the two seasons, and Kyran Lofthouse. Both Paxman and Lofthouse have proved to be exceptional signings by van Dijk after having them on loan the previous season. The final itself was very tight and could easily have gone either way. Maidstone opened the scoring in the 15gh minute through a Jack Renshaw goal. This goal was the only goal in a tight encounter, which meant that Erwin van Dijk would have to settle for 3rd in the league and no more. Maidstone won promotion to the Vanarama National League. The Slope or The Summit? After last seasons’ 14th place finish, a 3rd place finish is quite exceptional for van Dijk and Eastbourne. Yet there are some in the media who are saying that Eastbourne missed their chance, that Eastbourne have peaked and the only way is down. The doubts in the media have not gone unnoticed by Erwin van Dijk and they have led to some doubts forming in the manager’s mind. Was this season simply the start of something big? Or did Eastbourne miss their chance, will they starting heading down the slippery slope after summiting? Erwin van Dijk was a journeyman as a player and there is no doubt that he will become one as a manager. Ultimately, van Dijk wants to progress to the very highest level of football management and to do that he will sometimes need to be selfish. Is now the time to move on from Eastbourne and look for a higher level club? The next post in this series will reveal the outcome of Erwin van Dijk’s doubts, Did he leave Eastbourne to search for a bigger club or did he stay and try to build on this seasons successes? This entry was posted in Achievement Hunter Challenge | @VivaLaVidaFM, FM19 Stories, Football Manager 2019 and tagged achievement hunter challenge, eastbourne borough, england, erwin van dijk, fm stories, fm19, football manager. Bookmark the permalink.